I've started following some nail gurus on Instagram and, a little while ago, @misspopnails was at a fashion show, where she'd given the models super cool manis, using a triangle of negative space. At first, I was like, Why on earth would she do that? It's so strange. But the longer I looked at the pictures, the more I was intrigued by the concept. 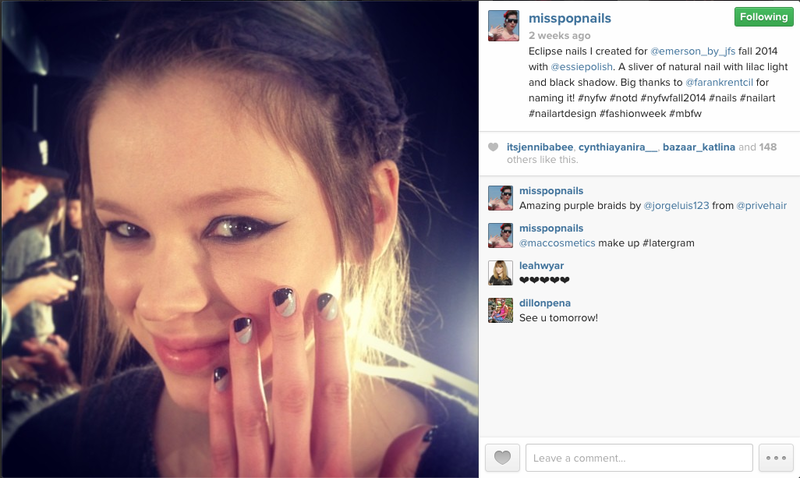 So, here's my rip-off @misspopnails-inspired runway mani! 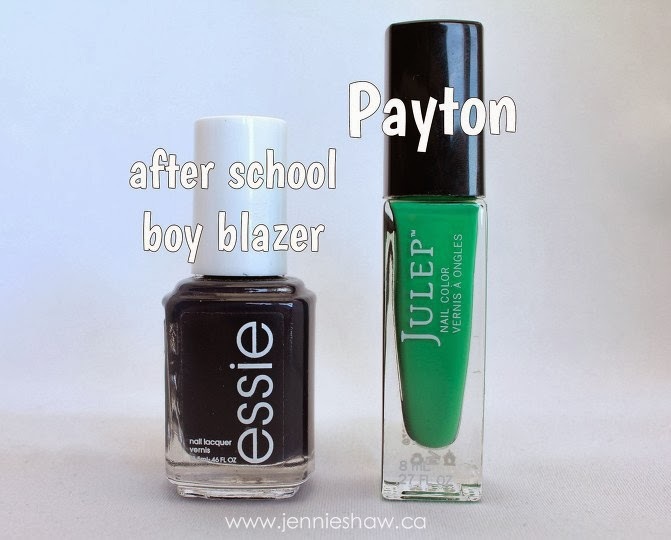 I started with two coats of Payton on the solid fingers. 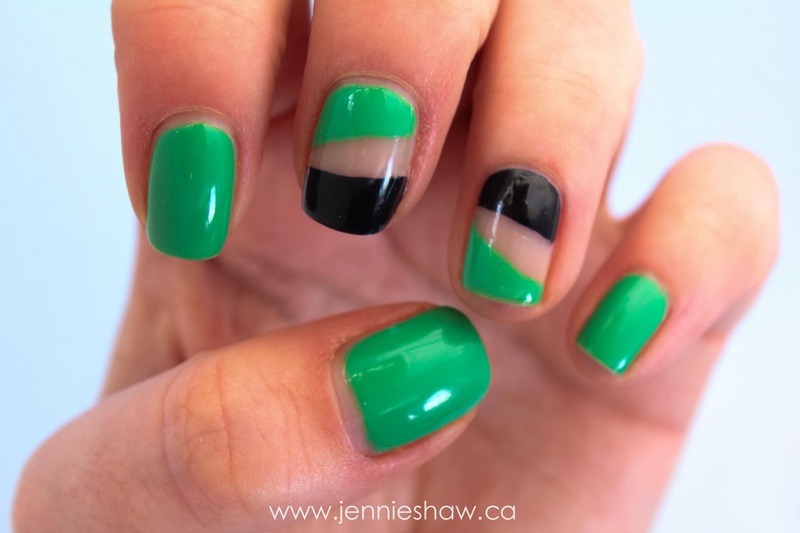 Then, with two pieces of striping tape, I made a triangle in the middle of my middle and ring finger nail. One side of the tape got two coats of Payton and the other side got two coats of after school boy blazer. I peeled off the tape, let it dry for about 15 minutes, and then did a coat of top coat, going diagonally, along the colour line to minimize bleeding (which still happened, but it was mostly the striping tape's fault *shakes fist*). Special shout-out to my pal AllieBee for leaving her rings at my house and, therefore, making it possible for them to be in this picture. Haha! So now that I've given the whole negative space thing a go, I can say, quite confidentially, that I looooooooooooooooooooove it! It's such a cool look! Like stained glass! On your fingers! Haha! Hope you all have an awesomely fun weekend! 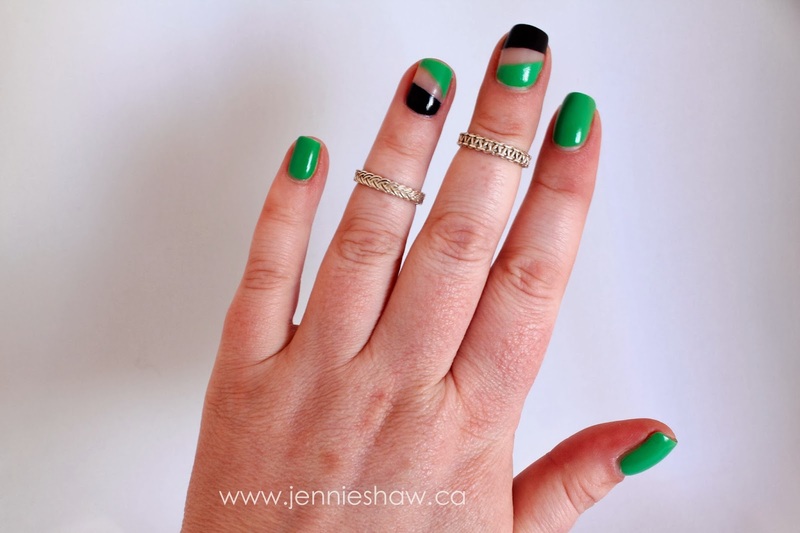 And don't forget to link up and make the rounds to see what other nail polish enthusiasts are rocking this week! The first few times I ever saw this trend I thought the SAME thing "why would you do that!" But the more I see it, the more I actually really love it! And yours looks SO FREAKING COOL! Awesome, friend!! Very cool look! I love the colors you chose for this. This kind of reminds me of that time I tried to do a chevron stripe, but the nail sticker removed the polish beneath it and left me with a bare chevron stripe in the middle. It was an accident at the time, but apparently there is a place for those kinds of "accidents" in the polish world! Hope you have a great weekend Jennie!! As soon as you said stained glass, it all clicked. AHA! Yes, very clever and interesting. It looks rather 80's to me, because of the shape (remember all the geometric shapes of 80's fashion?) but the natural nail gives that light-through-glass impression perfectly. And also, your cuticles. How do you do that?! They're so even and perfectly cleaned. I has a jealous. That's really different. I'll have to check out her ig page. I actually got talked into a Shellac mani last week. Which means, I actually have painted nails...what? ?